The advent of digital photography calls for effective techniques for managing growing amounts of color images. Systems that only rely on low-level image features are nowadays limited by the semantic gap problem, which leads to a mismatch between the user subjective notion of similarity and the one adopted by a system. A possible way to reduce the semantic gap is to (semi-)automatically assign meaningful terms to images, so as to enable a high-level, concept-based, retrieval. 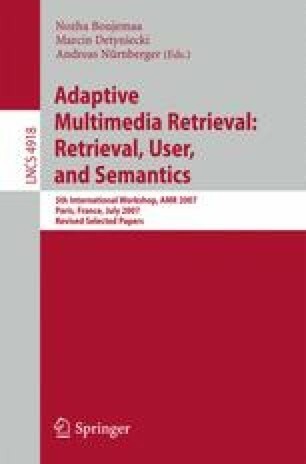 In this paper we explore the opportunities offered by graph-based link analysis techniques in the development of a semi-automatic image captioning system. The approach we propose is appealing since the predicted terms for an image are in variable number, depending on the image content, represent correlated terms, and can also describe abstract concepts. We present preliminary results on our prototype system and discuss possible extensions. This work is partially supported by a Telecom Italia grant.